A training collar can be an effective tool for teaching your dog to obey your commands because it restricts his natural inclinations to wander, run, investigate everything and mark territory. All dogs should be trained, especially larger breeds that can easily pull an owner along, jump on people, and possibly show aggression toward other dogs. Luckily, most dogs love to please their owners, so owners have an edge that can be used to shape behavior. Dog training collars can be classified according to the types of materials they are made from and how they're used. This is probably the most easily recognized training collar available. The choker collar consists of a length of chain or nylon rope with larger metal rings attached to both ends. 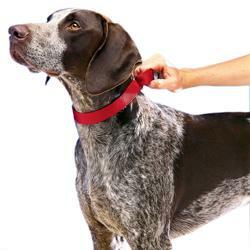 The collar is looped over the dog's head and adjusts to a tighter fit when the dog pulls against it. The discomfort associated with pulling helps teach the dog to walk at his owner's pace. This type of collar can be effective, but it can restrict airflow if the dog pulls too hard against it, so it should be used with caution and removed after the walk is over. Prong collars have blunt prongs that point toward the dog's neck and create pressure points on the loose skin when a correction is given. Despite the description, this type of training collar is generally considered safer to use than a traditional choke chain because it doesn't harm the dog or restrict air flow. When the dog tries to pull ahead, the prongs press against his neck. This action mimics a mother dog's correcting behavior when she grabs a puppy's loose neck skin. When used correctly and combined with a verbal command, your dog quickly gets the message you want to convey. Halter collars function like horse collars because they fasten around the back of the dog's neck, below his eyes and over his muzzle. This halter provides control over a dog's direction and movement without restricting airflow, panting, drinking or grasping objects in his mouth. Pressure on this type of collar pulls the dog's head towards the handler. Martingale Collars are typically made of nylon, and they're good for training dogs that tend to pull back and out of traditional collars. The collar has an additional loop attachment that the leash hooks on to, and pulling the leash tightens the collar, similar to a choker chain. However, the wide collar won't restrict his airway like the choker. Shock collars deliver a static shock to a dog's neck when an owner pushes a button on the remote controller. While this type of training collar can be used for teaching dogs not to wander too far away, to stop nuisance barking, and for a variety of other training goals, they are best used by professionals. If used incorrectly, they can do more harm than good. The following collars offer gentler ways to train your pet, and each receives good ratings from the majority of dog owners who have tried them on their pets. Gentle Leader is a halter-style collar that can be used to train puppies as young as eight weeks old. Unlike some training collars, the Gentle Leader applies pressure at the back of a dog's neck, not on his throat, to give a correction for pulling on the lead. Customers give this collar a 4.7/5 rating, and many praised how quickly the dog responded and learned to walk without lunging. The Pack Leader collar from Cesar Millan, also known as the Dog Whisperer, is designed to help you teach your dog not to pull on the leash. 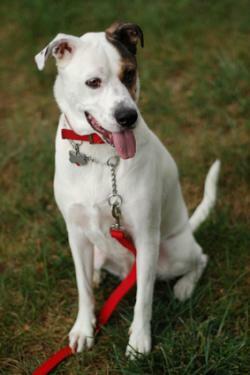 The collar has two connecting straps which hold the upper portion of the collar at the highest point of a dog's neck. This gives you greater control over your dog's movements, and you can make corrections with a gentle tug on the leash that comes with the set. Customers praise the collar very highly and give it a solid 5/5 rating. Note that this collar isn't appropriate for dogs under 13 pounds or over 23 pounds, or very short-muzzled breeds. The PetSafe collar is designed for dog weighing up to 55 pounds. When the dog barks, the collar automatically sprays a small burst of citronella to deter the barking. The dog learns that barking brings an unpleasant, although harmless, sensation. Customers who bought the product at Chewy give the collar about a 4.5/5 rating. Most are very satisfied with how well the collar works, nothing that it works fairly quickly. Take time to check out the various styles of training collars at your local pet supply store to make sure you choose one that suits your dog the best. Take into consideration your pet's size for the correct fit, as well as how much correction or control you feel your dog needs. Remember to praise your pet, and reward him when he responds to your training efforts.